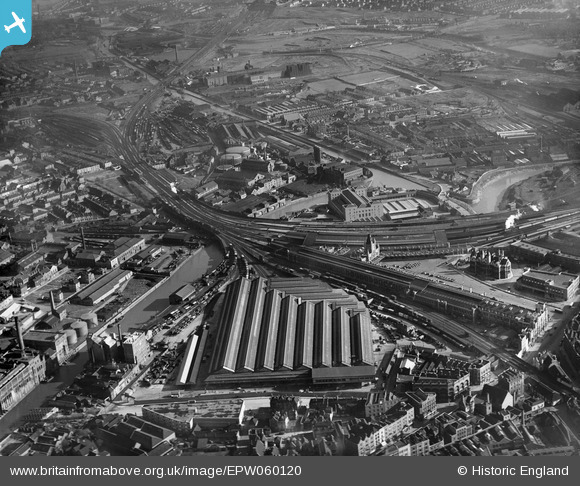 Temple Meads Goods Depot, with raised offices, the largest covered goods shed in the world 1926-29 by John Lysaught and co. demolished 1982-3, built on by bristol and west development et al c1999. It could accomodate 403 wagons and vans with 15 platforms, with tip balance bridges, conveyor belts and lister auto trucks and underground cellarage. In the 1930s a full length goods train left temple meads every half hour each day between 630pm and 130am to all parts of the country. "Island" stub remains of 1878 harbour branch brick viaduct closed 1965 demolished sept 2012. victoria st bridge, left, rebuilt c1960, demolished 1993. 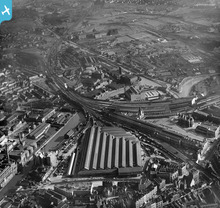 Temple and Pile St giders, right cut down c1967. Temple Gate was here 1240-1810. see this drawing by Marcus Henry Holmes 1819 http://museums.bristol.gov.uk/emuweb/php5/media.php?irn=26310 drawn from the front door of the Saracens Head of 1606, looking north across the former 52 feet wide portwall moat to the city gate, 12 feet wide. The postern gates either side were punched through the 7 foot thick city portwall in 1734 when the Norman arch was knocked out and raised and re-fenestrated in the early georgian classical style. The city coat of arms adorned the outer side whilst the arms of george 2nd (1727-1760) adorned the inner side.